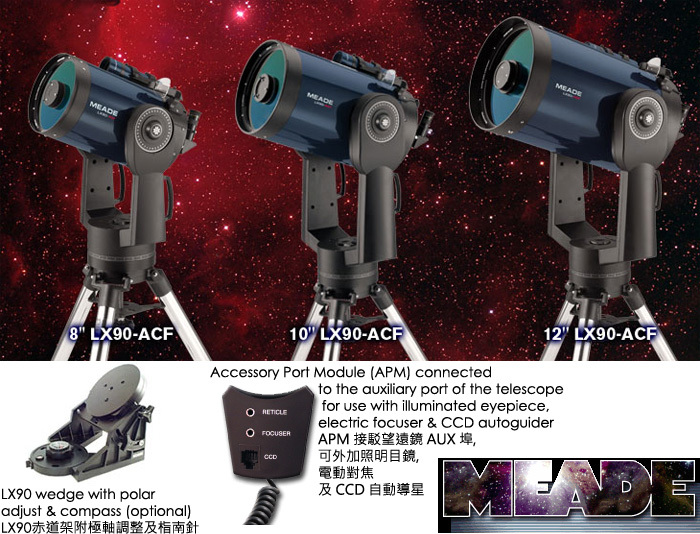 All purchases exceed HKD8000 amount, your school will be granted a free seminar on telescope operation, care and maintenance. 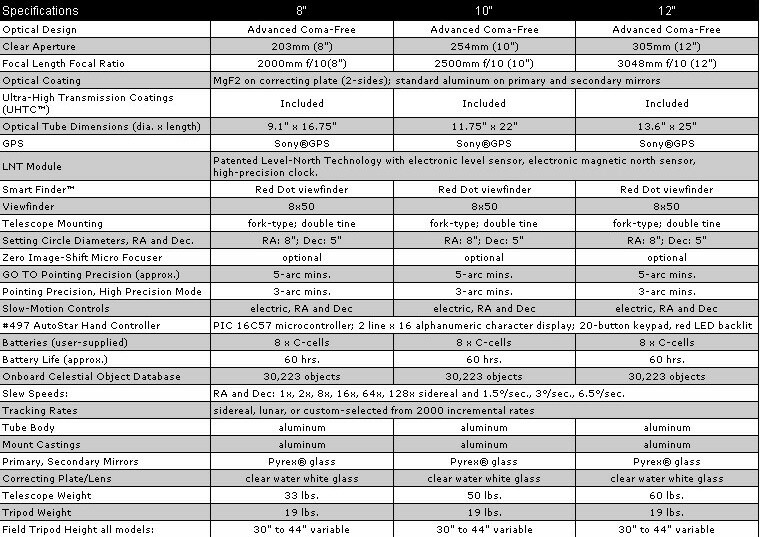 2 eyepieces: 25mm (28x) & 9mm (77x) 1.25"
planets, stars, galaxies and nebulas. You can print out star charts and even plan your observing sessions. 當 ETX ® 於 1996 年推出時, 已蹄造業餘天文學的革命, 其漂亮、輕便及多功能的設計及前所未有的光學質素, 導致 ETX 很快便成為全球最高銷售望遠鏡. 目前已售出超過 60 萬台. 超過 20 種目鏡, 如 HD-60系列, 5000系列 Super Plossl (SP); Super Wide Angle (SWA); Ultra Wide Angle (UWA), 倍率從 31x~250x, 適合觀測各類天體如月球、行星、深空天體等, , 配以 #932/#933 45° 正像稜鏡, 適合觀景賞鳥. 配以 #64 T-接環, 可作直焦拍攝用途, #126 2x 增焦鏡可將倍率乘二, 如有三個目鏡, 等於有 6 個不同倍率組合. ETX-LS6 / LS8 - ACF Telescope with LightSwitch Technology & Built-in Eclips CCD Imager內置CCD攝像頭! * The Meade ETX-LS features patented LightSwitch(TM) Technology for complete, stress-free user alignment. * Superb quality Advanced Coma-Free (ACF) Optics for a professional level instrument at an affordable price. 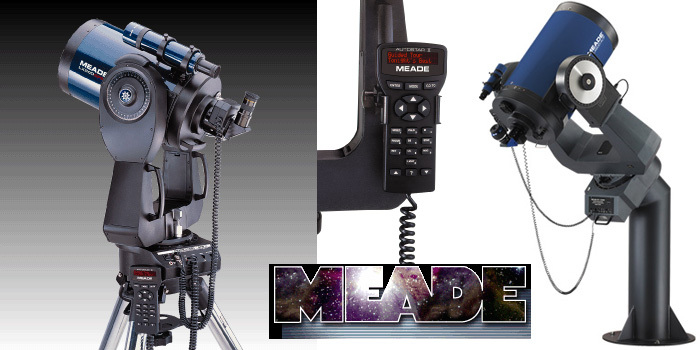 * The Meade ETX-LS Astronomer-Inside(TM) provides a full audio/visual lesson guide to enhance your experience. * Engineered with a built-in Integrated Sensor Module (ISM) which includes GPS and Level North Technology (LNT(TM)) sensors. * The Meade ETX-LS includes the built-in ECLIPS^(TM) CCD Camera, able to capture and display images right at the scope - or store for later use! LX-200 - 8" / 10" / 12" / 14" / 16"
Fast f/8 Advanced Coma-Free (ACF) optical systems with zero image-shift and a two-speed microfocuser. Giant Field Tripod— adjustable from 34" to 54"
LightBridge Truss Tube Dobsonian Telescope 10" & 12" & 16"
Explore craters on the Moon, the rings of Saturn, the cloud belts of Jupiter along with the four Galilean moons, as well as countless star clusters, double stars, nebulae and more. Includes AutoStar Suite PC compatible DVD astronomy software to chart the night sky and telescope instructional video. Telescope focal length of 900mm, f/8. 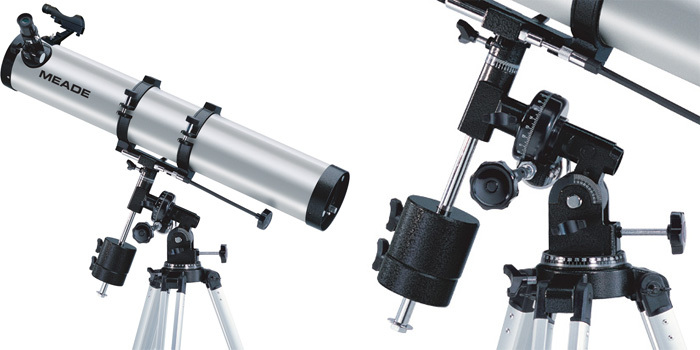 Features include a 1.25" rack-and-pinion focuser, sturdy metal equatorial mount with slow motion controls, setting circles, latitude control w/scale, two 1.25" eyepieces (MA9mm, MA25mm), an easy to use red dot viewfinder, and height adjustable full size aluminum tripod with accessory tray. 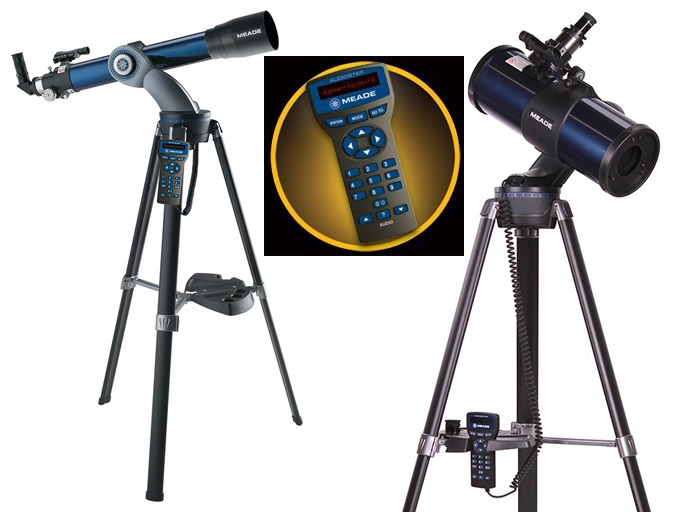 The Personal Solar Telescope (PST) is a Coronado innovation. The world's most popular telescope to observe the Sun. This 40mm diameter highly portable dedicated solar telescope features completly internal non-removable and student safe solar filtering optics with a 1.0 angstrom hydrogen-alpha (Ha) bandpass for great surface detail. The PST will show you the dynamic, ever changing prominences at the edge of the Sun as well as filaments and other surface details in amazing detail, all in the brilliant and distinctive red color of hydrogen-alpha light. Designed and manufactured to exacting standards, Meade Series 4000 Super Plössl eyepieces deliver wide 52° apparent fields of view (44° for the SP40mm) with all of the resolution, edge-of-field sharpness and color correction demanded in the most advanced visual applications. All eyepieces are multi-coated and include soft rubber eyeguards. Autostar #497 適用於 ETX-80, ETX-90, ETX-125 及 LX90 等望遠鏡, 它是目前最多功能的望遠鏡控制器之一. 只須輸入日期、時間及預先設定兩顆基準星 (alignment star), 按 GOTO 鍵, 你便可輕鬆地觀測多達 30,000 個天体. 它使用非常簡單, 就算初入門的觀測者在第一次亦很容易觀測到多個天体：土星環, 木衛, 獵戶座星雲, 亞米加星團等. 你亦可將 Autostar 與電腦連線, 透過 #505 連線套件及 Meade AstroFinder 軟體, 便可用滑鼠自如地操控望遠鏡, 不消十數秒, 望遠鏡立刻指向目標天體.